THE Federal Government has committed $2 million toward a feasibility study that will investigate options for new infrastructure to increase water supply and security in the North and South Burnett. Acting PM and Minister for Infrastructure, Transport and Regional Development Michael McCormack welcomed the feasibility study announcement, which forms part of a historic expansion of the National Water Infrastructure Development Fund, worth more than half a billion dollars. The $500 million expansion of the fund will include a feasibility component of $30 million. Feasibility studies will be used to support the Queensland Government finalise the design and approvals required to progress critical water infrastructure projects towards construction. Mr McCormack said water is the life-blood of regional Australia and believes the funding will be a game changer for many communities. "The $2 million we are committing for the Burnett regions' feasibility study further demonstrates that we are getting on with the job of supporting communities to work with the States and Territories and Federal Government, to identify, plan and build new water infrastructure," Mr McCormack said. "As a former rural bank manager, I know the value of a megalitre of water to a rural community," he said. "We're proud to be delivering water and wealth to rural communities." Federal Member for Flynn Ken O'Dowd said he hoped increased water security would help to drive economic and social growth in the region. "The feasibility study is great news for farmers in the region as it will examine a range of options and identify solutions to increase water supply that would underpin an expansion of irrigated agriculture, delivering new jobs and economic growth in the North and South Burnett regions," he said. "Through the National Water Infrastructure Development Fund, we have committed over $426 million to get construction under way on a series of key water infrastructure projects in Queensland. 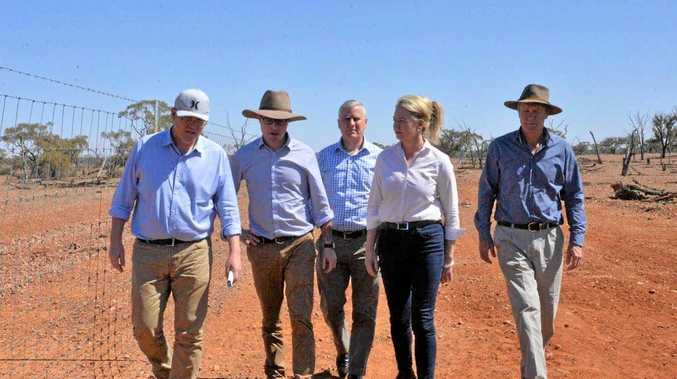 "This includes $54 million for Hells Gates Dam, $182 million for the Hughenden Irrigation Scheme, $176 million for Rookwood Weir, $11 million for the Mareeba-Dimbulah Water Supply Scheme and $3 million for the Nogoa Mackenzie Water Supply Scheme. "We have also provided nearly $25 million for 15 feasibility studies to identify potential new water infrastructure projects that could increase water supply and security for farmers, businesses and communities in Queensland." The expansion brings the fund's value to more than $1 billion, on top of the existing $2 billion National Water Infrastructure Loan Facility program. It will mean more than $3 billion is now available from the Federal Government to support State and Territory Governments and their project partners to build new water infrastructure, providing greater social and economic opportunity for Australians.